Reliant Estate Agents are delighted to offer for sale this immaculate 3 bedroom detached family home. 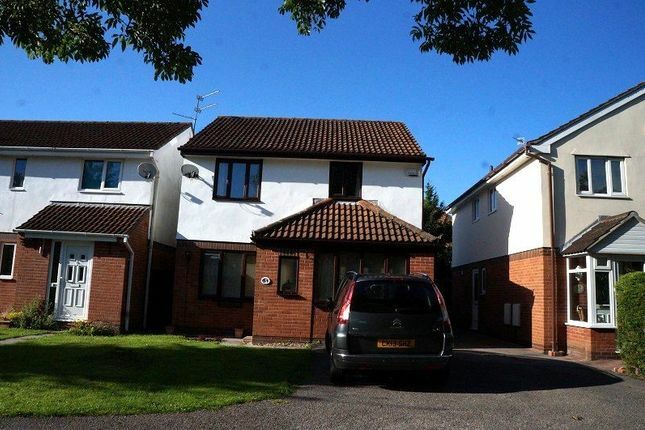 Located in popular Pontprennau it offers through lounge/diner and separate sitting room. Newly fitted kitchen and bathroom. Fully enclosed sunny rear garden and parking. Viewing A must. Close to M4 motorway and Corpus Christie High School this property wont be around long. The front garden is laid to lawn and has a hard standing for car. There is gated access at the side providing access to the rear garden. The entrance to the property is through an attractive Upvc Double glazed door to the side leading into a porch which has a window overlooking the front. The floor is tiled. Doors to lounge/diner and music room. Smooth painted walls and stipple artex ceiling. Leading from the hallway into what was previously the garage now converted into a music room/ second sitting room. Neutral carpet to the floor. Fire place with neutral hearth wooden surround and electric inset fire. Smooth painted walls and ceiling. Through Lounge diner with Upvc Double glazed window overlooking the front garden and Upvc window overlooking the rear garden. Smooth painted walls and textured ceiling. The lounge area has a Fire place with marble look hearth electric inset fire and wooden surround. Neutral carpet throughout and radiator. Stairs which are carpeted leading to landing the bedrooms and bathroom. Dining area - Archway leading into the dining area of the room which narrows slightly, radiator and Upvc window overlooking the rear garden . Smooth painted walls and stipple artex ceiling. Doors leading to bedrooms and bathroom. Hatch to loft space with pull down ladder, hall cupboard which houses the Worcester boiler and room for storage, radiator. Double bedroom with Upvc double glazed window overlooking the rear garden, radiator and neutral carpet. Smooth painted walls and stipple artex ceiling. Door leading to what was previously an ensuite. Leading from the master bedroom this was previously ensuite bathroom and is now used as a cloakroom with WC and washed basin with what was the shower cubicle now having been converted into a storage cupboard. Smooth painted walls and stipple artex ceiling. Double bedroom with Upvc window overlooking the front garden, radiator and neutral carpet. Smooth painted walls and stipple artex ceiling. Upvc double glazed window overlooking the front garden, radiator and neutral carpet. Smooth painted walls and stipple artex ceiling. Newly refurbished bathroom with low level wc, pedestal wash hand basin, panel bath with mixer shower tap and separate wall mounted modern shower over with glass shower screen. Double glazed Upvc obscure glass window overlooking the rear garden. Fully tiled with stone look wall tiles, dark wood laminate flooring and heated towel radiator in chrome. The rear garden is partially laid to lawn with a patio area and many mature shrubs. The garden is very private and fully enclosed. It is a real sun trap and a shrub covered area ideal for dining.